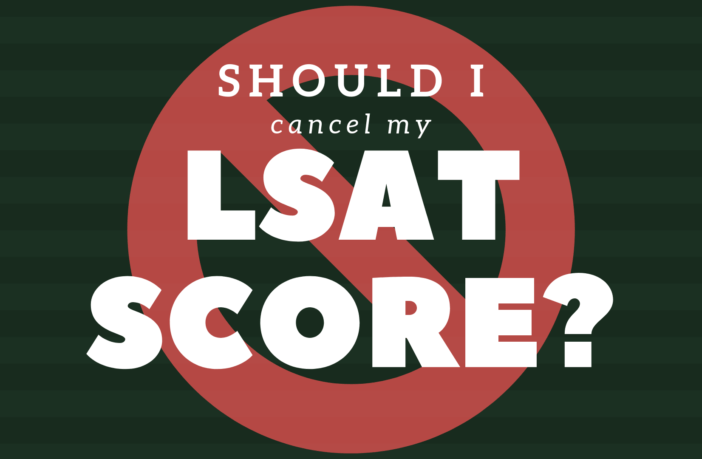 You are at:Home»LSAT»Should I Cancel My LSAT Score? First, congratulations on completing the LSAT! Even living through that test once is something to be proud of. The LSAT is always a big time ordeal! Now, about your score: everyone is going to second guess whether they did well on the LSAT in the next few weeks. However, if you really think you screwed up, you might be well-advised to cancel your LSAT score. 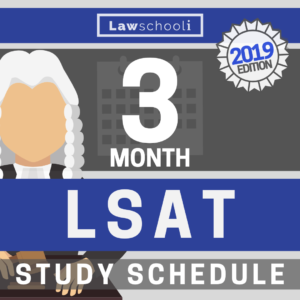 You only have 6 days to cancel (we have a post on how to cancel your LSAT score here). So should you cancel or let it ride? Here’s some advice on making this decision. 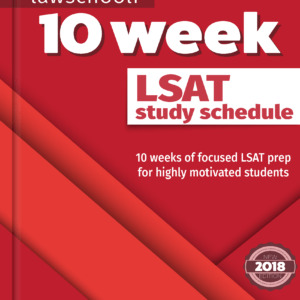 If you know for sure that the performance you just turned in on the LSAT doesn’t represent what you are capable of, then you should probably cancel. If, on the other hand, you can’t point to any specific area of the test where you had significant problems, you should almost always take your score. Anxiety and self doubt are normal after the test. It’s just as likely as not that you actually did better than usual. Say you missed a rule and totally bombed a whole game. This happens to you only rarely in practice. Cancel your score in this case. It’s not likely to happen again on a retake. You are able to complete significantly fewer problems than you normally complete on practice tests. Say you normally complete sections and on test day you had a section where you had to guess on five questions and another where you had to guess on three. I would cancel in this situation. You were sick and though you muscled through and completed all the sections, you think maybe it wasn’t your top-notch performance. This is a bit harder. Unless you know for sure you were getting a lot these problems wrong, it’s probably best to take your chances and wait for your score. You did perfectly on all sections except one, where you had to rush a little and guess on two questions. This is a totally normal test day scenario. I say don’t cancel here. If you only struggled on one section, always try to determine if it was the experimental section before you make any decision about cancelling your LSAT score. Here’s how to figure that out. If you decide to cancel your score, you must send a signed, written cancellation request to LSAC within six calendar days of the test. To be on the safe side, it best to cancel both by fax and by overnight mail. You will get a confirmation by E-mail from LSAC within 24 hours of your cancellation. If not, call LSAC to make sure that your cancellation request has been received. If you are deciding whether canceling is the best option, we are happy to listen to your individual situation and provide advice. Comments can be anonymous if you like so feel free to ask away! First off, thanks for all of the great LSAT info–your site has been a big help during all my prep. Here’s my question, I was shooting for a 170+ on exam day, and scoring in this range on my practice tests (maxing out at a 174). During the OCT test, I had a game in which I had to guess on 5 questions (i normally get a perfect on this section or a -1, -2). If I did well on the other sections, and best case scenario missed 5 in LG, then it’s possible that I hit my goal. Would it be better to wait and see what I ended up with? Or would the downside of having a score and possibly having that score averaged at the t-14 schools suggest that I cancel and shoot for December? 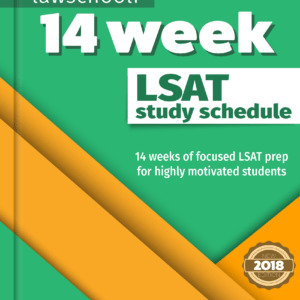 I am registered to write the October LSAT, however I am working 40-45hours/week and recently had to move to a new area. My LSAT prep is not anywhere close to where I would like and I have taken only a few prep tests so far. I am looking to give the LSAT and cancel the score. I have read mixed reviews regarding this option. Is it best to withdraw from the test and lose the registration money, or to give the test and cancel the score? I understand that each admission committee views the cancellation differently, however is there a general consensus on which option is better? I took the LSAT yesterday and admittedly I did something pretty foolish. I am aiming for a score of 172 or higher. In the 12 practice tests I took prior to the LSAT, I consistently scored between 170-175, but I did not practice using a bubble sheet until the last practice test I took. Thus, I underestimated the amount of time I would spend bubbling in answers on test day (2-3 seconds per question), and ultimately had to guess on the last question of every section because I ran 1 minute behind. Assuming I got all four questions wrong by default, I am now looking at a score that will probably fall between 167-170. If my bubbling issue had not happened and I received a score in this range, I would certainly take it again. My question is, since I know that the score I am almost guaranteed to get is lower than any score I was willing to accept before the test, should I cancel my score? I don’t want an unrepresentative score to bring down my average when applying, nor do I want to be in the uncomfortable position of justifying a major discrepancy between my two scores if I am able to do significantly better in October (which I expect to). Sorry for the long post. Your advice would be greatly appreciated. Thank you. Something very similar happened to me! Advice on this would be greatly appreciated. I will most likely cancel. Only 5 more days to decide, so please try to respond ASAP. So I took the LSAT in Sept. and received a 166, which I was disappointed in although was not too far off as I had been averaging 168/169. Since I am aiming to go to a top school I decided to try and retake in February, to my surprise after taking some time off and not studying I hit a 173 on my first PT of LSAT study round 2 and continued to hit consistently in the low 170s for the month or so I re-prepped. However I made a stupid mistake in LG on the third game and after realizing it had to rush through that game and the 4th; I made educated guesses with quickly drawn diagrams but certainly didn’t feel great about that section. I am essentially wondering if I should cancel; if schools are still reviewing my app and see a lower score I am guessing that will look pretty bad. FYI I am trying for several T10, my gpa is 3.8 and I have a masters in divinity from Harvard as well as some other unusual ‘softs’. My question is also in regards to cancelling my Feb LSAT score. I got a 170 on the Dec test (which I originally felt confident about and ended up making stupid bubbling mistakes) and was averaging around 175 on PrepTests, but I thought the Feb. test was difficult (due mainly to reading comp. and a few ambiguous LR questions), and wouldn’t be surprised to see a 165 or lower, especially if it is a -8 “curve” as some people are predicting. I felt fairly confident on the rest of the test, but I struggled through the 3rd physics passage and only had 5 minutes left to read and answer the last passage. I am considering canceling my score, but there is a chance (albeit slim) that even though I messed up on the reading comp I made up for it in the other sections. Would a worse score mar my 170 more than a cancelled score? I only have a 3.5 gpa which is pretty low for the schools I would like to go to (low T14) so I am nervous. In addition, if I transfer after my first year would this worse score/cancelled score have a terribly adverse effect, or are 1L grades the biggest determinant? Hi, I’m trying to decide if I should cancel my score from the Feb 2015 test. I read that you shouldn’t cancel unless you really messed up one section. I got stressed and messed up on at least a few if not more LG questions and I usually finish those and get everything right. Both LRs and RC seemed easier than normal for me and I don’t think I missed more than 1 or 2 in each, if that. The reason I’m not sure is because this was a retake. I already have a high 160s score from my first test, and I was trying for the 170s to get into my dream school. I’m worried that getting a lower score this time will hurt me more than just canceling and applying with the 169. But I don’t know if I actually did worse. Anyway, your articles have been really helpful throughout my studying, and I’d appreciate your opinion. I retook the LSAT for a second time on Saturday, and I messed up on games 3+4 of the logic games. I don’t know if I should cancel my score and just keep the 165 I got on the September LSAT because I doubt I got higher this time around. How do you think law schools would view a 158 (my first score), a 165 (my second score), and 165 or lower (my third score)? I kind of want to keep my score just to see if I lucked out and got higher but I don’t know if it would hurt my chances. I just took the September 2014 LSAT. I thought it was going all right until I hit the last section, LG. For some reason, I wasn’t able to make a lot of inferences and ended up brute-forcing my way through all four games so that I ended up guessing on 5 and I’m afraid I might have missed some others too. I wasn’t that confident about LG going into the test because I had mostly been prepping this summer with the older exams and only began using the practice tests from the last three years since last week, and I found that the LGs from recent years were a lot more difficult (they seem more open-ended) but it was a little too late by then to fix my approach. Since I’m aiming for 170+ and T14 schools, I’m wondering if I should cancel and retake. I’m not very confident that I hit above 170 this time, likely high 160s and maybe lower 170s if I happened to get lucky on those guesses. If I do cancel my score and retake, do law schools still view that as taking the test twice? Would it be better to have a score in the upper 160s or show up as cancelled? My thinking is that if I cancel it, then at least the next time I take it I won’t have the pressure of needing to outperform my previous test score. If I end up retaking, do you have any recommendations for what I should do if I’m having trouble with LGs from recent years? I’m not sure what exactly about the LGs changed over time, but I could do the ones from the 1990s without much problem. I self-studied with Powerscore’s book before doing the actual exams. I took the LSAT yesterday, and there was one game that really threw me for a loop. I think I got at least half the questions right on it and narrowed down the remaining responses to two before moving on to the next game. The same thing happened on it. I got about half of the game right and took a 50/50 guess on the remaining questions after having eliminated some of the answers. Would you say canceling is a good idea or not? I felt really good about all the other sections. Hmm, that sounds like a pretty tough games section. Whether to cancel or not depends on whether you think this was atypically bad for you specifically. If your practice LSATs usually go much smoother than this, that might indicate a cancel is a good idea. However, it doesn’t sound like a total disaster. A lot of people reported similar difficulty with the games (see the newest post on our home page). Ultimately the decision is up to you, but I say don’t cancel unless this was significantly bumpier for you than usual. Hey guys! So i took the LSAT yesterday and although i feel like i did as well as i normally do on practice tests, i know i could have prepared better! Unfortunately, i ran into your website in the last month of my LSAT prep efforts and until then i had been prepping inefficiently so in the last month i followed your “increase my score in 30 days” schedule. It helped me significantly but according to my practice scores, not enough to get into the tier 2 schools i want to attend here in Boston (possibly BC or BU). Should i cancel? or should i keep my score and just plan on taking it again in December if i didn’t score what i expected? I think keep your score in this situation. Schools in that range won’t put any weight lower score, so if you retake and improve in December, you’ll be considered based on the strength of that higher score.